The New Orleans Museum of Art is widely recognized for its African collection. Resonance from the Past presents a selection of its finest works, which includes ancestor figures, symbols of authority, and objects of transformations. Yoruba, Dogon, and Fang objects. New Orleans is often called "the most African of American cities." Its music and cuisine are recognized worldwide as unique contributions to the cultural fabric of the Americas; the most famous of those contributions--jazz, America's quintessential musical idiom--is intrinsically African in origin. It is, therefore, appropriate that the New Orleans Museum of Art was among the first American municipal museums to form an important collection of African art. Unlike most European national museums which began as repositories for the material culture of their colonies, the New Orleans Museum of Art focused on aesthetics. 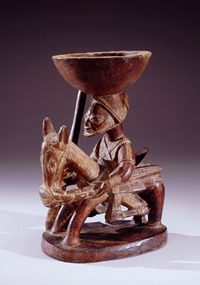 In 1966, the museum opened a permanent gallery for the arts of Africa and a major bequest in 1977 from Victor K. Kiam added over a hundred works to the collection. While covering much of the African continent, the museum's collection is not an encyclopedic presentation of the art of all African peoples; its strongest concentration is in Yoruba, Dogon, and Fang sculptures. Resonance from the Past includes ancestor figures, symbols of authority, and objects of transformations. Sculpted artworks, including masks, pots, costumes, and musical instruments, represent elements of divination and initiation ceremonies, bestow power on their owners, and serve as altars to mediate between humans and the divine. Curated by Frank Herreman and organized by the Museum for African Art in New York and the New Orleans Museum of Art, Resonance from the Past comes to Wyoming from the Smithsonian Institution in Washington, D.C. Funded in part by the Albany County Tourism Board, the National Advisory Board of the UW Art Museum and Wyoming Public Radio. Left: Male Figure, Dogon peoples, Mali, Wood, stones, Museum purchase with funds from an anonymous donor, 99.179, Cat. 4. Center: If Divination Bowl: Agere Ifa, 19th century, Yoruba peoples, Southern Ekiti region, Nigeria, Wood, Victor K. Kiam Bequest, 77.256, Cat. 37. Right: Gelede Masquerade Headdress: Imado, Early 20th century, Yoruba peoples, Ketu region, Nigeria/ Republic of Benin border, Wood, pigment, Gift of H. Russell Albright, M. D., 90.391, Cat. 49.